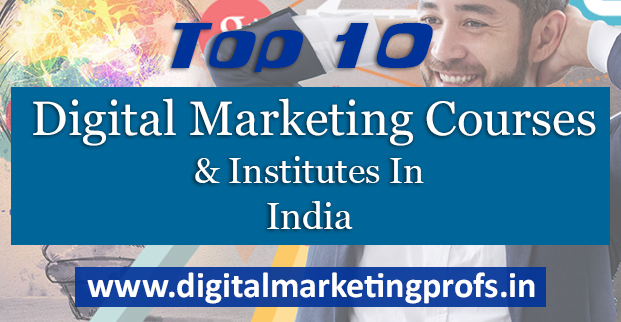 There are many Digital Marketing Institutions, and training centers in India, which are indulged in providing career-oriented digital marketing courses and online training programs for students around the world. By joining such valued courses, you can become a professional digital marketing expert with ease. Also, you can become a Google certified digital marketing professional by joining Google certified courses and training offered by leading digital training institutes of India. You can find top-notch digital institutes at major cities of the country like Delhi, Bangalore, Mumbai, Kolkata, Chennai, Hyderabad, and many more. But, it is recommended to get enrolled in courses offered by authorized digital marketing training centres in India only. At the recognized digital training institutes in India, you will find a wide range of internet marketing courses to join such as SEO, SMO, SEM, SMM, PPC, Adwords, etc., Apart from that, you can avail training on live projects of SEO and SMO that will help you learn all things practically. Apart from that, the recognized digital marketing colleges in India provide more benefits to the students in the form of job placements as well. However, it helps interns to find their career pathway in competitive field with ease. Furthermore, the reputed institutes will also offer you Google certification courses and Google Adwords trainings that are essential to lead in digital marketing field. The students can learn these courses at highly acclaim digital training institutes in the country. All in all, there ample of benefits and good career scope by joining valued courses and training events of renowned digital marketing colleges or training centers in India. Digital Vidya is one of the top-most digital marketing education and training institutes in India. It is counted among the best digital training centers in Asia as well. The institute has completed more than 250 training programs in which 6000 candidates have been participated yet. Being a market leader, Digital Vidya is a Google certified company and offers top-level digital marketing courses for the students worldwide. Over the years, the institute has covered many digital marketing training programs in India and across the world. Started in the year 2009 under the governance of Mr. Pradeep Chopra and Mr. Kapil Nakra, the institute has got good progress in the competitive industry. At present, institute has association with some leading brands in the industry named Reliance, eBay, Citibank, GM, etc., and provides quality digital services to them. All above courses are verified and based upon the latest digital industry trend. The students will also get one month internship and training on live projects in all courses. To teach such courses, the centre has a team of qualified digital marketing experts, faculty and trainers as well. One can find branches of Digital Vidya in Delhi and other parts of the country as well. Delhi School of Internet Marketing is counted amidst the leading digital marketing training centers in India. Being headquartered at Delhi, institute offers different types of digital marketing courses and training services that are enough to become a successful digital professional in future. The institute has a good track record in rendering best coaching for diverse digital marketing courses such as SMO, SEO, SMM, SEM, PPC, Adwords, etc. Apart from the centre provides full-fledged practical training on live projects of SEO and PPC campaigns that are essential for online promotion of website. The institute has spread its wings across India and opened its branches at Bangalore, Kolkata, and Hyderabad cities as well. Moreover, the DSIM has been trained 9345 professionals at present. To give quality education, institute has organized more than 246 batches, and has appointed hundreds of faculties, and digital marketing professionals as well. Apart from that, institute offers good job placement opportunities for interns as well. NIIT is also reckoned as a leading digital marketing training and web development courses provider in India. Over the years, NIIT has spread its wings in more than 40 nations in the world and trained thousands of students in digital marketing worldwide. In India, NIIT has hundreds of NIIT centers at diverse corners of the country. The most popular NIIT centers are located at Delhi itself. As of now, the institute claims to be trained more than 40,000 digital marketing professionals in India. Besides, the institute provides live training on SEO projects and social media practices under the supervision of skilled faculty and trainers. Moreover, the courses of NIIT are also Google certified that are in high demand in the industry. SimpliLearn is a well-known digital marketing training company based out at Bangalore, India. Besides, the institute has branches in overseas at Houston and Texas as well. It was established in 2009 by Mr. Krishan Kumar. The institute has good feet in digital marketing education and training that enable students to learn best tips of internet marketing in depth. 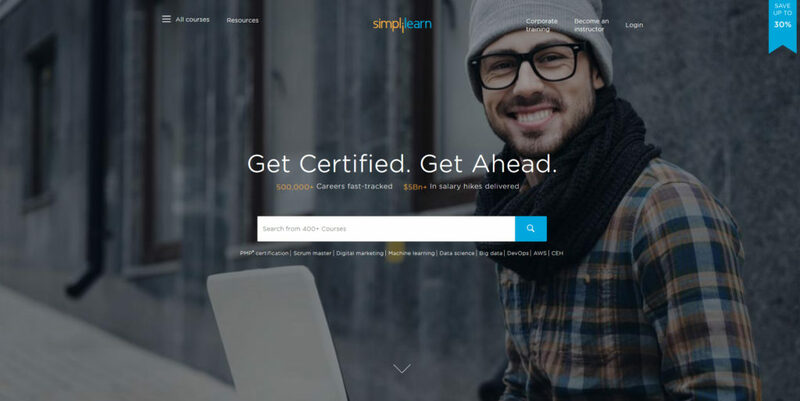 The SimpliLearn offers more than 100 certified courses along with online training sessions for learners. Also, the institute provides OMCP certification for those candidates who have completed vital training and learning sessions in digital domain. 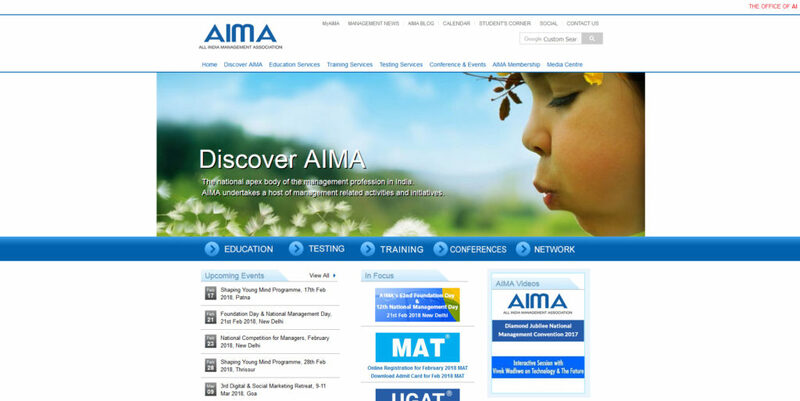 AIMA is another emerging digital marketing training institution in India. It has launched vital digital training programs for beginners and experienced candidates as well. AIMA has partnered with Digital Vidya for content and learning course materials as well. The institute is dedicated to serve education and training for working students as well. However, the center has started separate batches for students to learn best digital marketing courses on weekends. Digital Academy India also ranks well among leading digital marketing companies in India. The centre offers proffessonal digital marketing courses and training that enable students to become an internet marketing expert in a short time. As of now, institute has been trained more than 5000 candidates including both beginners and experienced ones. HiAim is a renowned digital marketing education centers based out at Moti Nagar, Delhi. Being an ISO 9001:2008 certified institute, it has offered career-oriented digital marketing courses and training programs for learners. The institute provides finest digital marketing courses that will cover topics like SEO, SEM, SMM, Google Adwords, Web analytics, etc. The centre has been trained more than 1 lakh students and experienced candidates across India. The courses will be taught within 180 hours. Under this time frame, 50 hours will be spent on learning classes, and 40 hours will be consumed in live training sessions. Rest 50 hours will allow students for self-learning, question and answer sessions. It’s not over, the ranked students will also get placement facilities in reputed companies by the institution. Manipal Global Education services provide well-versed digital courses and furnished training class room for learners. It is one of the highly affordable digital training centers in India. The institute offers digital training courses at affordable charges Rs. 25000/- only. The courseware include the best learning material that will include topics like Social Media, Search Engine Optimization, Web analytics, Online PR, Email Marketing, etc. To guide such topics, institute has a team of qualified digital trainers, who can guide every topic of course as well as give live training on the SEO projects. There is a provision of job placement can also be availed in this institution. EduPristine is a foremost institution in India that is known for endowing vital courses like Business analytics, Big data, Hadoop, Accounting, Finance, etc. Besides, institute has good feet in digital marketing and training services as well. The institute charges reasonable for digital marketing courses about Rs.33000/- The courses will educate students about basic to advance level topics like SEO, SMM, SMO, Web analytics, Adwords, etc. All topics can be covered in two weeks course program under the guidance of experienced digital marketing experts. Learning Catalyst is also famous training centre having 7 branches in India at cities like Delhi, Mumbai, Bangalore, Chennai, Pune, Ahmedabad, and Hyderabad. The institute offers well-organized digital marketing training programs having 6 weeks integrated learning sessions and training as well. To educate and train students, institute has qualified and Google certified digital professionals as well. As of now, the centre has given good training to more than hundreds of applicants and also given them placements in leading IT companies in Delhi/NCR. The renowned centre of learning catalyst is based out at Hauz Khas in Delhi. So, interested candidates in Delhi/NCR can join digital training programs of this institute and may lead in the industry easily. For outside Delhi students, the centre provides online training facility as well. Thus, the applicants can approach to any of above institutions in India and join best digital marketing courses offered by them. It is advised to check with the courses, training programs duration, course fees, etc., before enrolling in courses of any institutions in India. 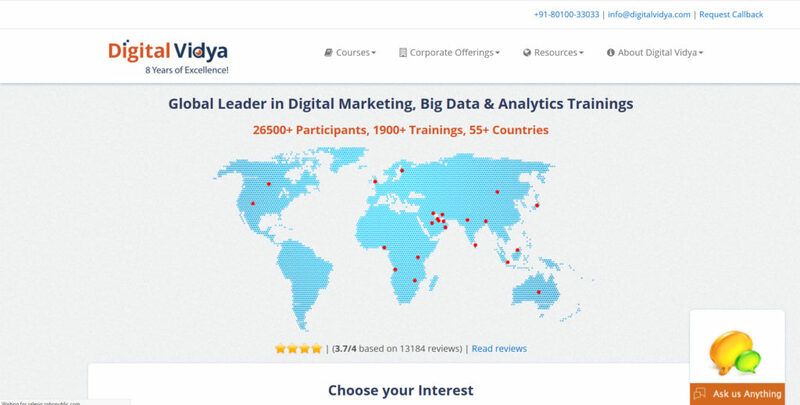 Let’s explore advantages of joining digital marketing courses in India? The students and professionals of digital marketing can experience world-class study environment in leading digital training institutions in India. Also, you will find furnished classrooms as well as quality learning material to teach students all topics of digital marketing from scratch. In renowned digital marketing centers, you will find opportunity to work upon live SEO and SMO projects. Besides, students can avail tips to promote client’s website at different search engines, keywords search and marketing campaign designing services during live training sessions. By joining digital training courses in prestigious institutions in India, you will get chance to learn SEO tips and tricks from Google certified trainers as well. They will give vital suggestions to handle complex SEO projects and PPC campaigns of clients using relevant Google tools and Google Adwords keywords. All can be experienced under the guidance of Google certified trainers available in leading digital training institutions of India. The leading digital training centers in India are dedicated to provide career-oriented digital marketing training to the students. Also, they provide job placement benefits that help them find their career gateways and start career in digital marketing field with ease. The job placements can be provided in renowned IT companies like Infosys, HCL, NIIT LTD, and so on. To avail high standard of digital marketing training in India, you should search leading digital marketing training institutions in India. At such stops, you will find Google certified trainers and highly organized internet marketing courses like SMM, SEM, SMO, SEO, Adwords, Web analytics, etc. By joining such courses in any of the authorized digital training centers in India, you will come to know how to promote client’s business website online in a right way. Besides, students will explore all things practically under the best live training sessions online. Moreover, the applicants will get benefits of job placements and Google certification in desired streams from trusted digital marketing institutions in India.